Mexico is a land of diversity — awe-inspiring ancient cities and tourist resorts. Experience the warmth and generosity of the Mexican people. Journey with us and know the everyday food, customs and traditions of Mexican life and step back to a time of pagan mysticism. Colonial cities, Mayan temples, traditional cultures, rainforest reserves and dazzling coral reefs, join our Encounter Expedition across this tropical 200-kilometer long coastline located on the eastern tip of the Yucatán peninsula. This place has it all, an abundance of history, culture and nature. 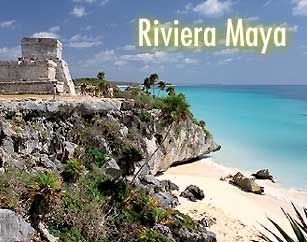 Few places on earth cause as much amazement as the Riviera Maya. On the stunning coast of the Mayan Riviera lies the most beautiful sea in the world, the Caribbean, extending across the horizon with its incredible turquoise blue waters and mild surf caressing the glistening alabaster white sand along an impressive stretch of palmed lined beach. Mexico is an ancient land full of legends, fascinating history, ancient cultures and respected traditions. Truly experience the spirit of the Mexican culture, and immerse yourself in its essence.